A two day Regional Consultative Meeting of Local Governance and Community Development Program II was organized by Regional Coordination Unit, Biratangar on 20-21 December at Hotel Asiatic, Biratnagar, Morang. The overall objective of the meeting was to review the regional level progress and identify possible activities and priority areas for the transition period after June 2017 while also discussing potential intervention areas for the next phase of Sub National Governance Program. A two-day regional level consultative workshop of the Western Development Region was organized in Pokhara on December 22-23, 2016 by LGCDP. The overall objective of the programme was to strenthen LGCDP Programme outputs and provide efficient technical backstopping to the LBs thereby service delivery of LBs made effective. Total of 57 core participants, 9 specialists from Programme Coordination Unit (PCU) and RCU experts participated in the workshop. Regional Consultative Workshop of Local Governance and Community Development Program organized by Regional Coordination Unit Dhulikhel in Collaboration of Program Coordinate Unit, MoFALD completed on 23 Dec, 2016. 19 December 2016, Hetauda. A one and half day regional level annual consultative workshop on Local Governance and Community Development Programme (LGCDP) was organized in Hetauda on 18-19 December 2016. 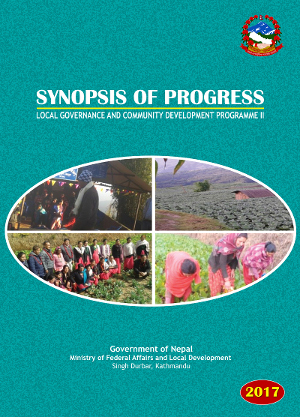 The objective of the programme was to share the regional level annual progress achieved in the previous fiscal year, lesson learned by the local bodies, and to gather the suggestions regarding the potential areas to be considered while devising transitional and successive programmes of LGCDP. Regional Conslutative Workshop for Nepalgunj region of LGCDP was organized on 16-17 December, 2016 at Cygnett Inn, Nepalgunj. International Volunteers Day 2016 was celebrated at Hotel Yellow Pagoda, Kathmandu, Nepal. The event was organized by UNV Nepal in coordination with other volunteering organizations in Nepal. During the event, winners of the competition I volunteer-here's my story were also awarded.